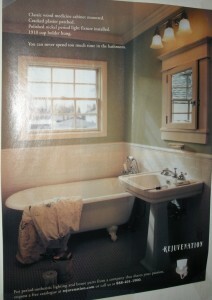 One of the major things that needed to be fixed on my house when I moved in was the bathroom.. 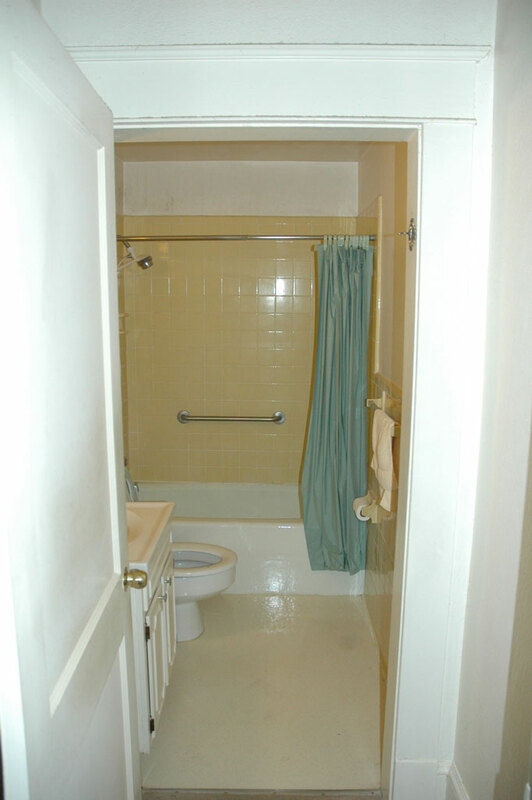 The original bathroom was last remodeled in 1982.. Not only did it use horrible yellow/gold tiles, but it had almost no available light.. The only light came from a tiny fluorescent fixture above the sink.. The kicker was that for the remodel they built a drywall box inside the old bathroom covering up the window and original ceiling making the room even more narrow.. The vent fan was also relocated to inside a closet and really didn’t pull much moisture out of the room at all..
My goal was to redo the bathroom exposing the original walls, window and make it look similar to a rejuvenation ad that I have seen for years in Old House Journal.. I opted not to get a clawfoot tub and stick with the cast iron tub that is already in the bathroom and keep the toilet, but the rest of it pretty much had to go.. 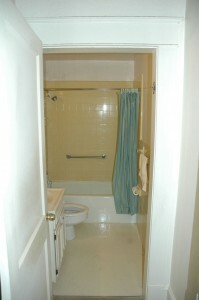 There also was an inner doorway leading into the bathroom which made it seem even smaller and more cramped.. I am not sure what the original intent was for this second doorway, but it too was to be removed.. I have already ordered and picked up a replacement window for the shower area.. It’s a vinyl/plastic window with frosted glass.. 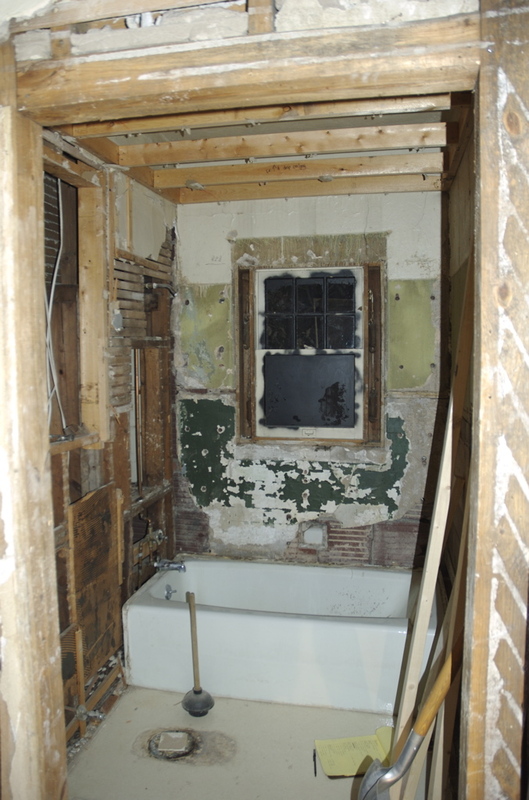 Even though I am restoring the original sashes in the rest of the house it makes no sense to have a wooden window in a shower.. There isn’t much left to say at this point as far as the progress goes, but here are some photos of the demolition.. Toilet and sink removed. 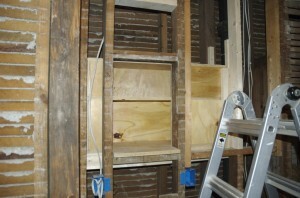 One section of tub surround removed. 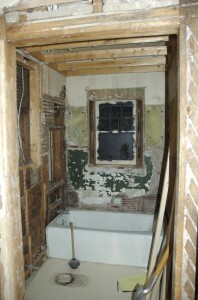 All tiles removed and window re-exposed. 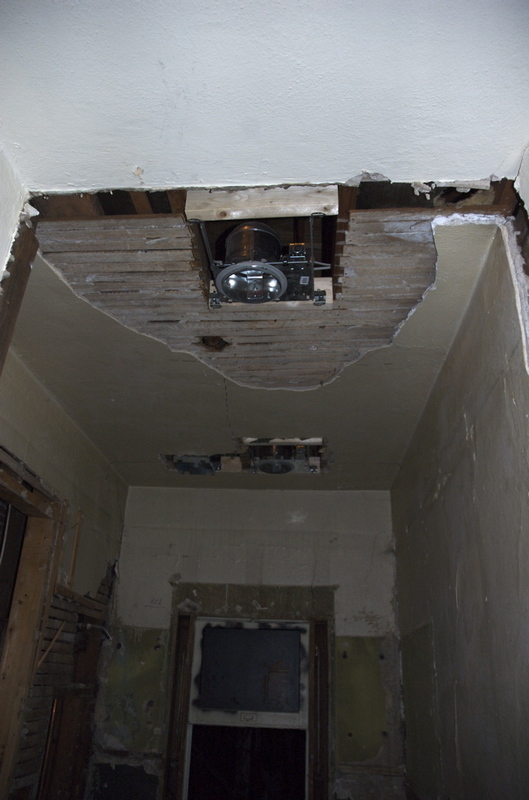 You can still see the dropped ceiling framing in place. 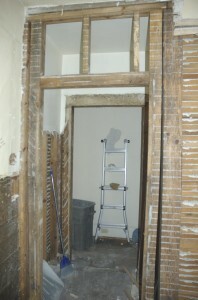 Inner doorway down to framing and ready for removal. Inner doorway removed, ceiling exposed and recessed lights and fan installed. 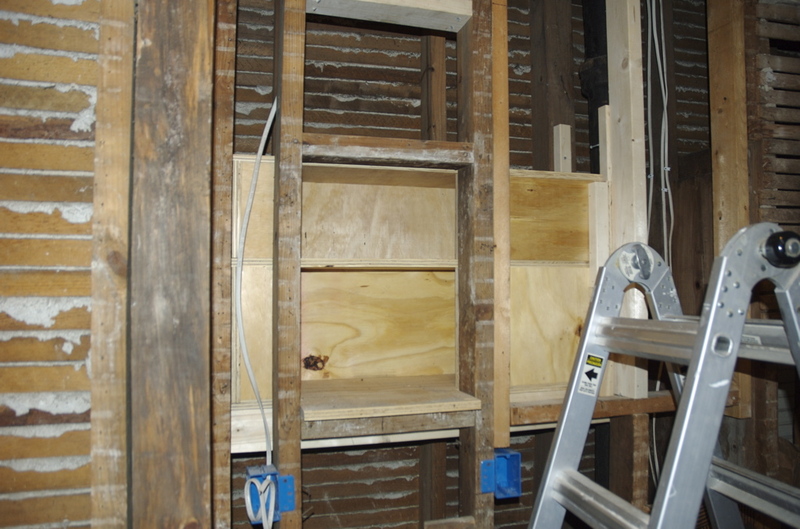 Since there isn’t much storage space in the bathroom and I removed the old “medicine cabinet” above the toilet (which also housed the exhaust fan) I opted to build as large a cabinet as I could in the space between the bathroom wall and the bedroom behind it.. This space is about a foot wide since the sewer vent runs through the space. I built a cabinet out of 3/4 plywood that extends to the left and right a good amount. When the wall is drywalled it will be dressed with a mirror like the rejuvination ad above, but it will hold considerably more stuff than it appears to.. 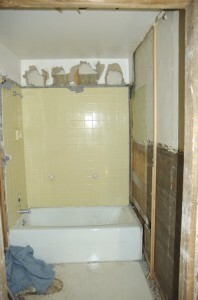 Currently the bathroom is partially re-walled and is starting to look like a room again.. I still need to order tiles in the next few weeks but either way the bathroom will be much bigger and brighter than before.